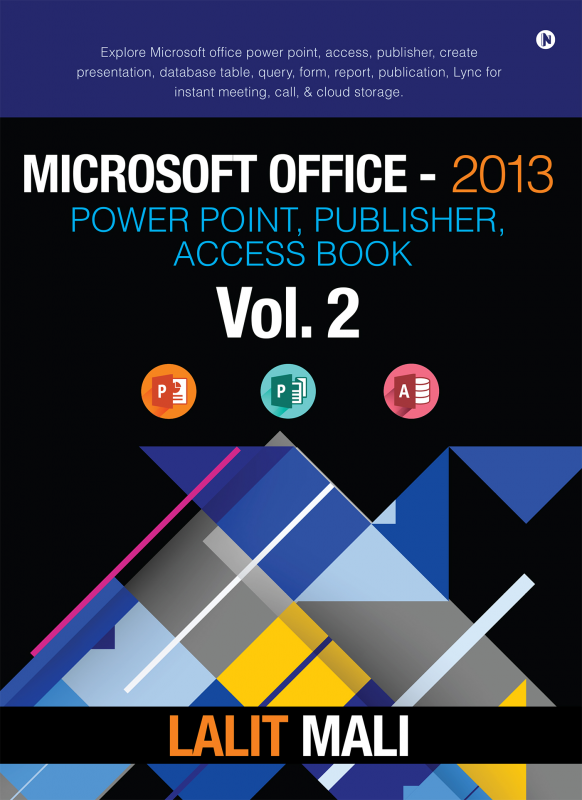 Microsoft Office- 2013 Power Point, Publisher, Access Book - Vol 2 Explore Microsoft office power point, access, publisher, create presentation, database table, query, form, report, publication, Lync for instant meeting, call, & cloud storage. Microsoft office PowerPoint is acompletely multimedia featured presentation design software, which is used by many students, organizations, marketing companies and industries for showing or representing some useful information in the form of slides containing graphics, pictures, multimedia, animation, videos, charts, shapes, clip arts and so on. Microsoft Access is a database handler program that allows us to store and retrieve database in the form of table, query, report, form, label, macros and other aspects such as adding access control. Similarly, using Microsoft Publisher, all kinds of graphic designs, pamphlets, books, advertisements, agendas, manuals and manuscripts can be created along with additional attributes of Lync application that allow instant meeting, voice and video multimedia conversations; using cloud storage for business can facilitate access to cloud storage for all kinds of Microsoft document extensions.